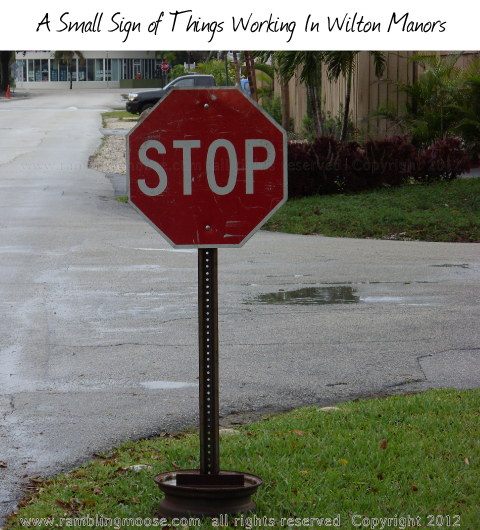 After having someone who does not live in Wilton Manors whine at me about things that are wrong, I had a situation that proved to me that that sort of negativity is really pointless. That is why the picture of the stop sign. You see, living here in Wilton Manors, just like any other place, you get a vastly different view of how things work than someone who is a tourist or has a business. Tourists look at things and either have almost all positive or all negative views, never terribly accurate. Businesses have an amplified view of the negatives of a given area, and usually there is one specific issue that set them on the long downward spiral of turning on an area - and again, are never terribly accurate. We residents are the ones who have to live with the mess of the tourists, and the disruption of the businesses, and generally are the ones that set the rules. If a city doesn't work well, it's probably due to the residents not paying attention. Eventually those who don't work get noticed and those politicians get rolled out. I have a strongly positive impression of City Government here in Wilton Manors. Being on the Board of Wilton Manors Main Street, I hear many of the complaints of the businesses, and the plans for the future, and sometimes get to hear some news a little before most. I also get to speak with some of the business owners and some of the City department heads. Again, after all is said and done, I have a strongly positive impression of City Government here. After all, how many cities can you "Walk Through" your permitting for building changes and expedite things yourself? It is possible to get "Personal Service" that a city not much larger than we are cannot hope to give. I had that driven home to me last night. We were out with Mrs Dog for a wander around town before bed. There's an intersection near me that needed to have stop signs put on it and the neighbors lobbied for it. There was some push back from a particular whiny group of people who didn't see the people flying down that block after they left the bars and after hearing the stories about drunk drivers crashing into trees, the City Commission approved the three way stop sign for that intersection - much to the relief of the residents nearby. Last night, around 10PM we noticed that one of the signs was down. People were assuming no sign, no yield, and were back to flying through the intersection at unsafe speeds. The suggestion was made to email the Director of Public Services, David Archacki, since we knew him. Of course, this being the smartphone era, Kevin immediately did so, while walking into a wet palm tree. I shrugged and laughed and didn't think too much about it until this morning's 6AM dog walk. When I rounded that corner again, the sign was still down. You really don't expect anything to happen at 6AM on a Monday morning, so I walked on home. At 830 after Kevin left for work, I get a call saying there was a temporary sign out on the corner. That's the one you see on the top of this post. So once again, I'm pleasantly surprised at how efficient things can be here. Thanks, Dave, we really do appreciate your work. So, what's the weather like? Can you wear headsets while driving? I'm Bill and I have Digital OCD!